The potato is the world’s fourth-largest food crop (maize, wheat and rice are the top three). The potato is a good source of vitamin C, potassium and B6. Interested in growing potatoes? These tips will help you grow a bumper crop of your favorite tuber. • Temperatures – Potatoes tend to grow well in cooler temperatures. It is important that you plant them early enough so they can grow to a size that you will find pleasing. • Seedlings – If you are growing potatoes from seedlings, start them off indoors. A seed tray can be used to help you sprout the plants. Early spring is the best time to plant these plants, so make sure you start them indoors early enough. They take about 3 weeks to sprout. If you live in an area that has hot summers, purchase the earlier variety of seeds. • Fertilizing the Soil – Prepare the ground for planting by tilling the soil and adding a rich compost. Water it well. • Planting Using the Stout Method – Planting potatoes is easy using the Stout method. There is no digging involved. You will need a good supply of ground cover. Most people use hay for this. For planting potatoes using this method, spread 4 inches of hay where you want to plant. Place sprouted potatoes on top of the hay, 4 inches apart. Then cover the potato with another 4 inches of hay. Water it. Over time you will notice that the tuber has begun to sprout. Continue covering it with hay as it grows and only water it when the hay feels dry. • Planting from Seed – If you choose to plant potatoes from seed, use the method mentioned above for sprouting the seeds. Once you have completed that and fertilized your garden it is now time to plant. Plant the potato plants in rows of tilled earth. Space them 6-12 inches apart. Water them when the ground feels dry. Harvest them once the tubers have grown to the appropriate size. You will notice that the plant has now produced tubers. Continue watering and mulching until they are ready to harvest. 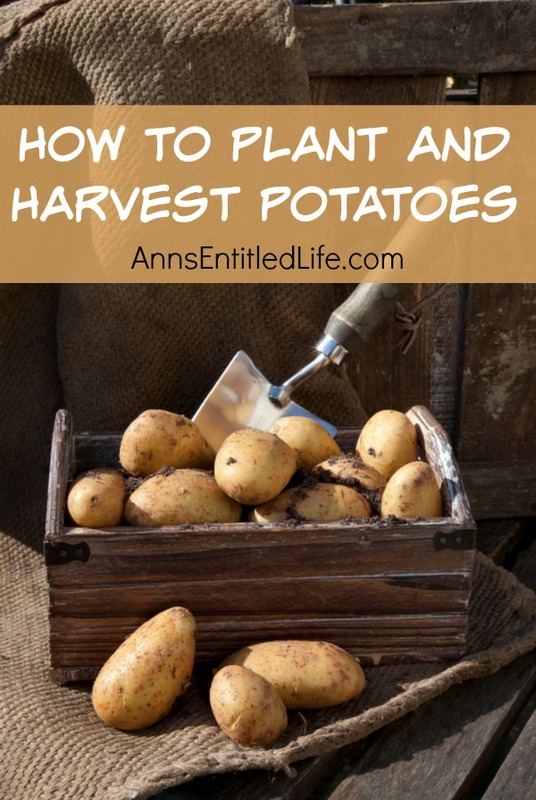 Pick the potatoes off of the plant and leave the leaves to turn to compost or mulch. Other Tips for Growing Potatoes- Gardeners have many choices on which method or equipment that they would like to use to help them grow this crop. Potatoes are very adaptable and can be grown using the Stout method, garbage bags, wood boxes, hilled rows, or even wired cylinders. Choose what method of growing potatoes is most convenient for you! Do you have any tips for growing potatoes?